Jose Guadalupe Posada died 100 years ago. 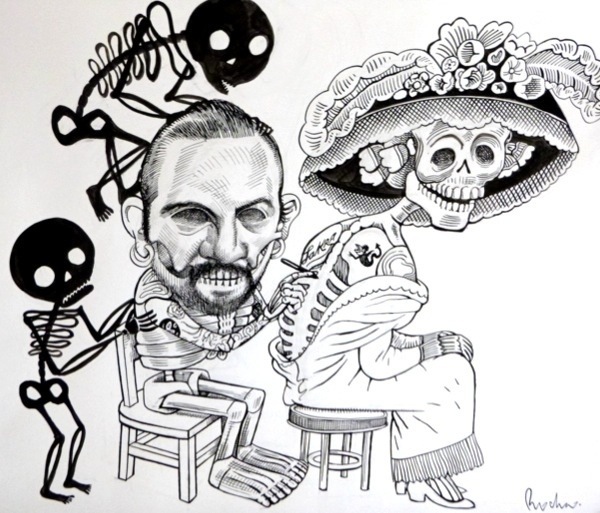 He is best known for his skeleton images such as Catrina. A working illustrator for Mexico City’s penny papers, Posada may not have thought of himself as an artist. Only after his death was he lionized by the great Mexican artists Jean Charlot and Diego Rivera. Rivera said that everything before Posada was (Spanish) colonial art, and so Posada’s illustrations were the beginning of postcolonial Mexican art. 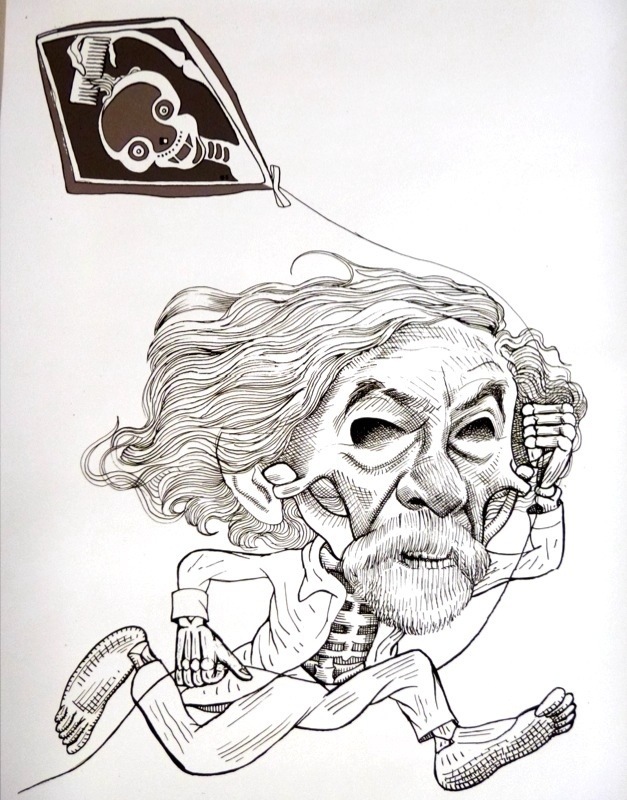 A modern Mexican master of caricature Gonzalo Rocha has produced a wonderful homage to Posada. Rocha asks what would Posada draw if he was alive and working today? Posada would have plenty of gruesome subject matter: femicides in Ciudad Juarez; beheadings, narcotrafficking, corrupt union officials, rigged elections. 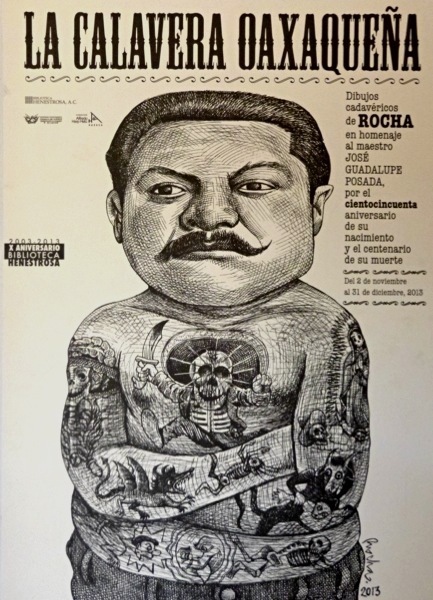 Boldly crosshatched in India ink Rocha’s rogue’s gallery skewers Mexican politicians, millionaires, and fine artists. I had the good luck to see Rocha’s work in Oaxaca at the Biblioteca Henestrosa Library Gallery. 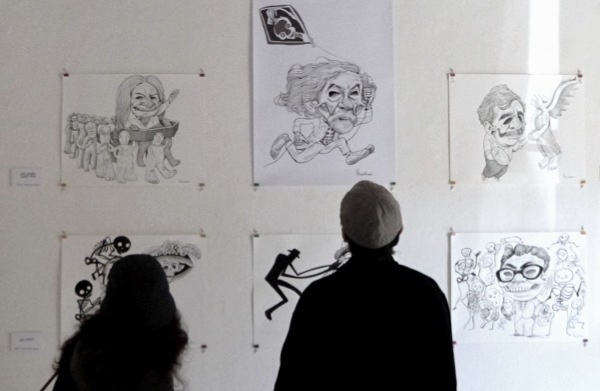 A wall filled with local Oaxacan artists, living and dead, was a big hit at the exhibition. 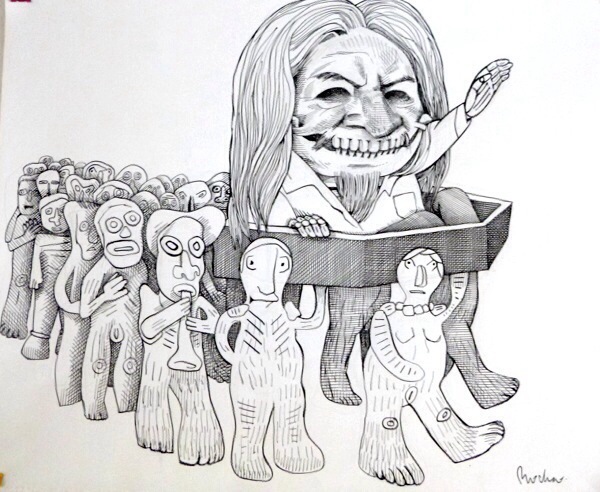 Alejandro Santiago, who died last year, is transported by figures from his masterpiece, 2501 Migrantes. Maestro Francisco Toledo, living, is pictured running barefoot with a kite. Dr. Lakra, living, gives Catrina, dead, a tattoo. I met these 3 Oaxacan maestros, Santiago, Toledo, and Lakra. I find Rocha’s caricatures brilliant. He makes drawing look easy, just like Posada did. Rocha is fairly generous in his representations of these artists. 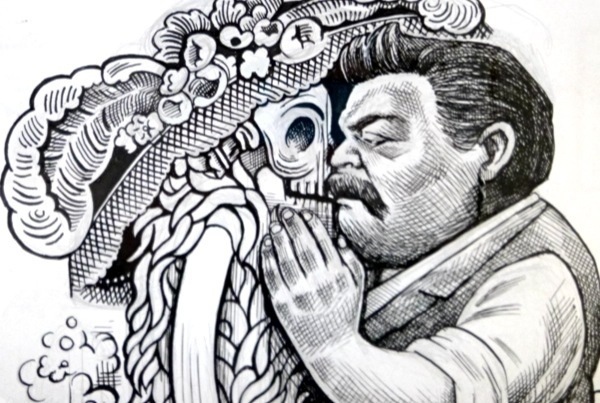 Rocha’s art gets angrier with political figures. 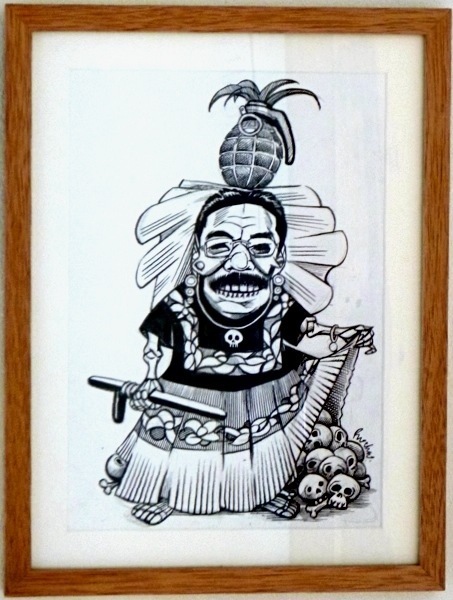 Below is his take on Ulises Ruiz, the former governor of Oaxaca drawn as a folkloric dancer with a pineapple/hand grenade. Note the pile of skulls under his skirt. Ruiz was ruthless in his crackdown of dissent during 2006. Amnesty International concluded that his state operatives murdered at least 28 protesters. Many In Oaxaca say the number is far higher. 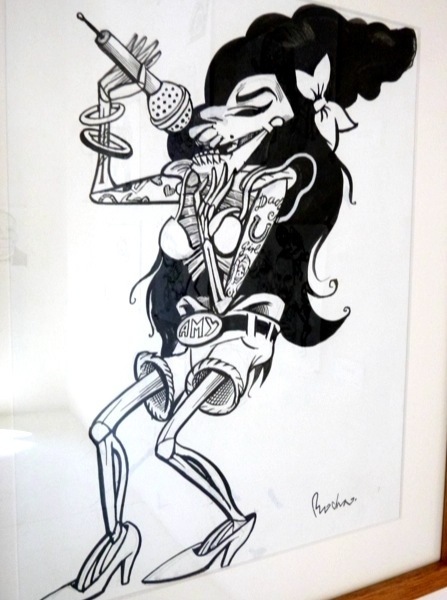 Finally, for those unfamiliar with the famous Mexicans pictured above, see Rocha’s take on Amy Winehouse. All images copyright Galvino Rocha, reproduced here for purposes of review. < Previous Lapiztola Stencil Collective, Spray for Us. Next > Covarubbias, more than a Caricaturist. Hello. I work for Oxford University Press. I am trying to contact Rocha in order to license a cartoon for use in a textbook. Could you put me in touch with him? Sandy, I am sending Maestro Rocha a note via facebook with your contact info.